On the first of January, 1998, municipalities across the Province, including those within the Districts of Manitoulin and Sudbury, were required to contribute to the financing of social programs that were being downloaded by the Provincial Government. Social Housing was one of the downloaded programs. On December 31, 2001, housing units formerly managed by the Manitoulin District Housing Corporation were transferred to the Manitoulin-Sudbury District Services Board (DSB) where property management services have been performed directly by the DSB Housing Services Department. The Local Housing Corporation was dissolved and on February 1, 2002, the Manitoulin-Sudbury District Services Board assumed administrative responsibility for all of the Non Profit Housing Providers within the DSB area. 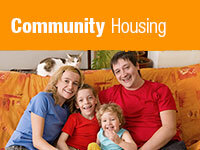 Families, seniors, single adults, couples or those with special needs who are seeking information with respect to Rent Geared to Income Assisted Housing can learn more about our programs by contacting our main office or by contacting any one of our 4 satellite offices located in Noëlville, Chapleau, Little Current or Warren.